Malifaux – I've been working on demo boards that will fit all the encounter locations for Malifaux. 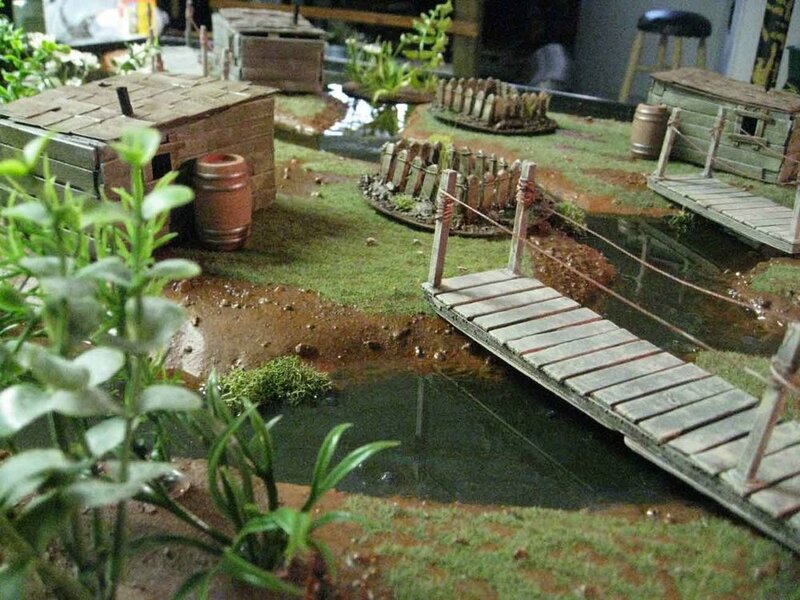 The sewer board that can be seen in previous posts works for all the urban encounter locations, on the reverse side of the sewer board is a generic earthy board that can work with the mountain mining town terrain as well as the swamp terrain available in the online store. 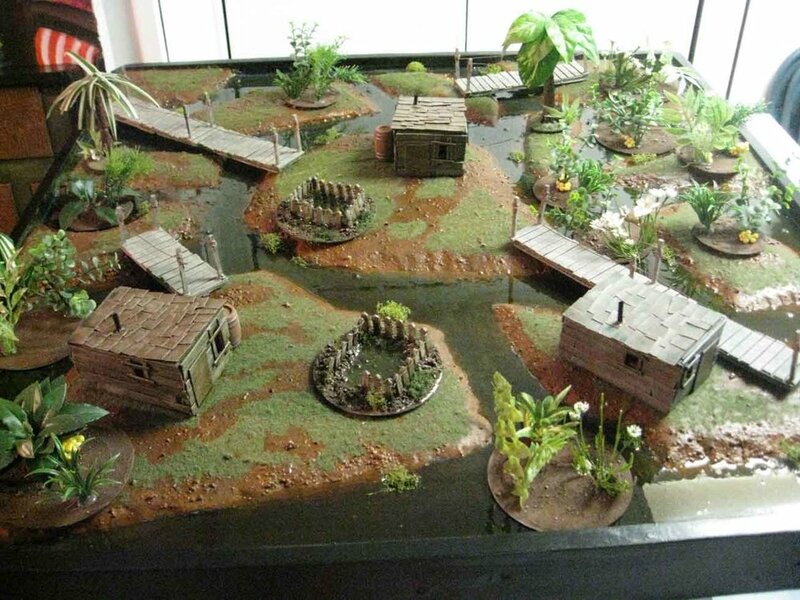 I've almost completed a dedicated swamp board, that will work for all the swamp/bayou encounter locations. The water effects were achieved using Envirotex. The basic board is completed and I'm in the process of making the matching terrain. I went through the possible special terrain features an am making a set of them for each of the boards. The plan is to just count the water as a water effect unless "Bog" is flipped. There are also 3" and 5" forests. I haven't decided if I want to make a quicksand pit or something else for the hazardous terrain feature. On the flip side of this swamp board will be a generic urban board. I found some textured wall paper that looks like cobble stones, which saved me a ton of time and more closely matches the Dragonforge Designs bases I'm using for my Resurectionist crews. This board is going to take some time yo figure out how to make the buildings so that they can be repositioned and still look like they belong. Initially I wanted to wire it for street lamps, but realized that a fixed board would be better suited for that. The problem with fixed board is that they eventually get old and games become stale. 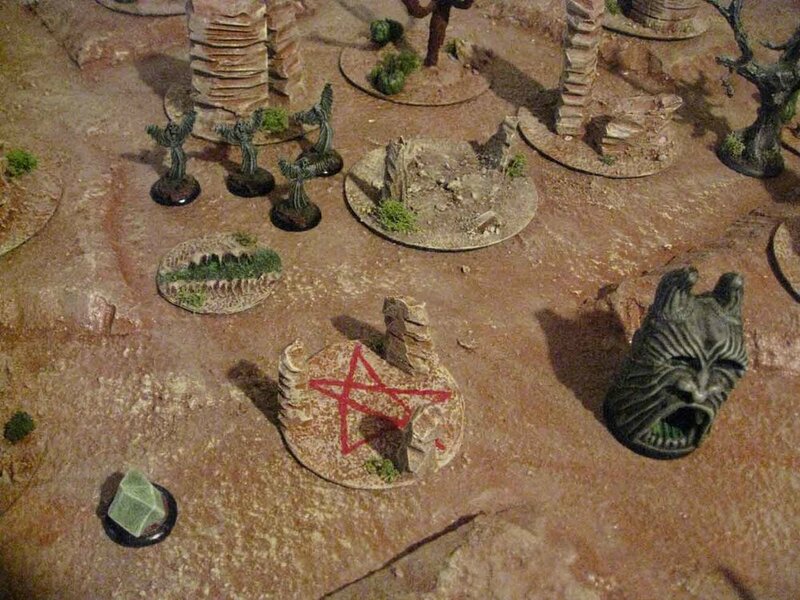 I've also completed a desert board for the remainder of the encounter locations. One side has fixed hills and the other is just a flat surface with matching texture. The cactus patches count as forests with a little twist they are dangerous terrain with a 0/0/1 Poison 2 damage flip. It shouldn't make that much of a difference in the games but does add a small risk/reward element. I'm still working on the graveyard and bottomless pit as the hazardous terrain element. Right now I have some GW spirit hosts that are acting as mysterious effigies. I'm sculpting 30 mm Easter Island type heads that will replace them once finished. The Ancient monument was some plastic toy I found in my bitz box, I'm working on sculpting something similar to cast for the other boards. Also for this set I've made a soulstone vein, magical nexus, deadzone, campsite, hanging tree and a treasure counter. The plan is to make two different colored treasure counters for each set just in case both players flip them. More pictures of all the boards are available in the gallery section.